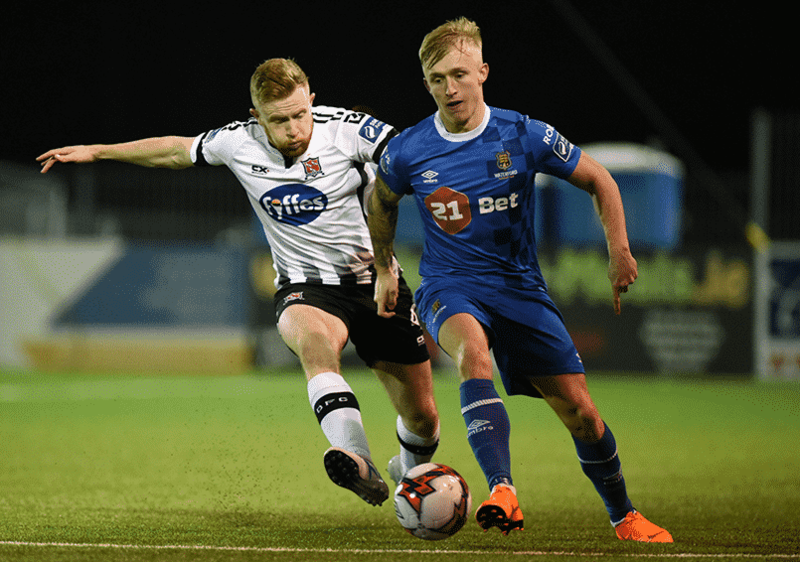 Not even the brilliance of Waterford FC goalkeeper Lawrence Vigouroux could deny Dundalk victory in their SSE Airtricity Premier Division clash played at Oriel Park on Friday night last as an unfortunate own goal from Garry Comerford settled the tie in favour of the hosts. It was rough justice on Comerford and his teammates as they gave it their all throughout the course of the ninety minutes. Led brilliantly by keeper Vigouroux who made a couple of outstanding saves and defender Kenny Browne, it looked as if the Blues had done enough to leave the Louth venue with a share of the spoils. 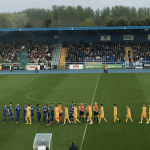 Blues manager Alan Reynolds was forced into making four changes to the side that defeated Bohemian FC as John Kavanagh, Dean O’Halloran, Garry Comerford and match winner against Bohs Sander Puri came into the side with Rory Feely, Paul Keegan, Bastien Héry and Courtney Duffus losing out. Dylan Barnett and Comerford cut out some early danger from the hosts before Sander Puri set up Derek Daly out on the right side on 17 minutes but despite Gary Rogers tipped his effort over the bar, the match referee Rob Harvey awarded a goal kick. Puri got free down the right side three minutes later but defender Chris Shields blocked the ball out for a corner kick before Stanley Aborah hooked a left-footed shot from 15 yards wide on 25 minutes after getting on the end of a Dean O’Halloran cross. Vigouroux made another great save five minutes when he kept out a shot from Dundalk skipper Dane Massey as the sides went in at the sound of the half time whistle on level terms as the Blues gave as good as they got. Dundalk should have opened the scoring on 51 minutes when Chris Shields set up Michael Duffy who saw his low shot saved by Vigouroux but Dane Massey blazed the rebound high and wide when he should have hit the target. 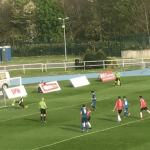 Hoban did have the ball in the back of the Waterford net soon afterwards when he touched home a parried effort from Jamie McGrath but the flag was raised for offside before Gavan Holohan latched onto the ball at the other end on 57 minutes however couldn’t direct his effort on target. The Blues could have opened the scoring on 73 minutes when John Martin raced clear at the other but with only keeper Gary Rogers, he came off his line to deny the attacker before the same player set up Gavan Holohan minutes later however his left-footed effort was wide of the right-hand post. It looked as if Waterford had done enough to get a point from the game but there was a final twist in the final minute of four added as with seconds remaining Duffy sent in a cross from the left that was headed on by Patrick Hoban, but the unfortunate Garry Comerford deflected the ball past his own keeper Lawrence Vigouroux to give the home side all three points.